We have a large potato (about 3 feet tall) and a dice with Mr. Potato Head parts on it. The children chant, "One, two, three, toss!" as each gets a turn to throw the dice. They then put up the piece on the potato head (pieces from therapyfunzone.net). We're working on body part vocabulary along with colors and prepositions. Our students love having the birthday song sang to them and since one of our KDIs (from our curriculum) is knowing each other's names, this becomes a great activity for it. 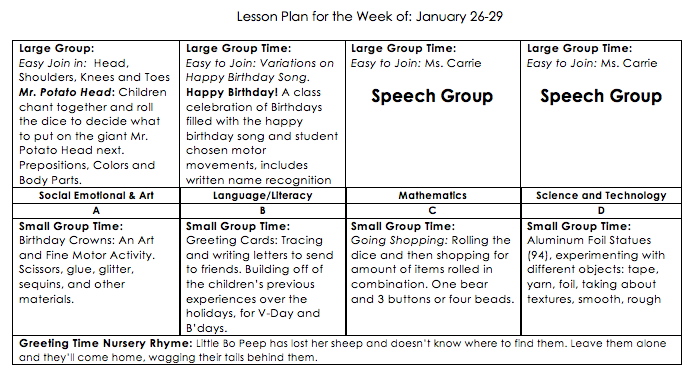 Pulling in name recognition (both in the curriculum and some of our IEP goals), we'll write down the name of a student on the white board and if it's their name they get to come up to the front to have the song sung to them. They get to pick what we do while we are singing the song to them (e.g. stomping, patting knees), flying like super heroes etc.